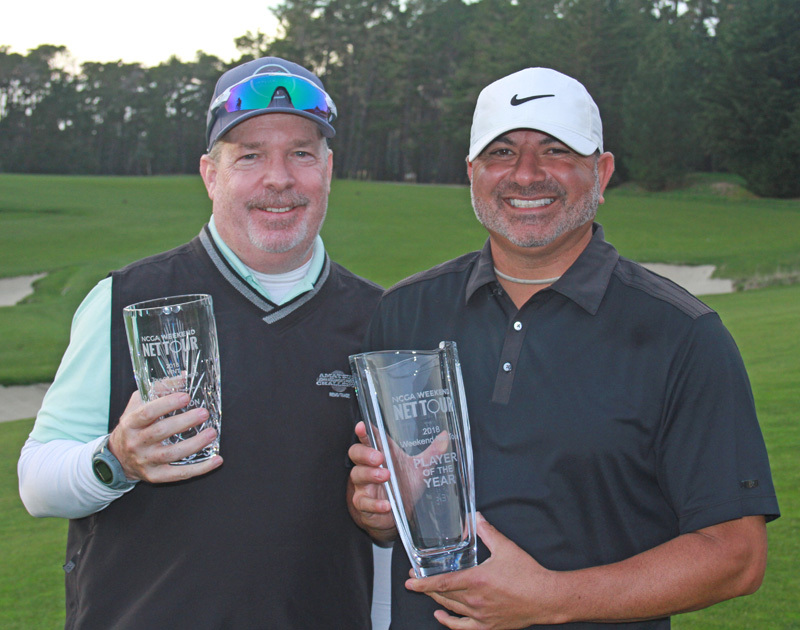 There was a pair of champions at the conclusion of this year’s Weekend Net Tour Championship, held Sunday at par-71 Poppy Hills Golf Course. John Stricklin, a member of E-Club East Bay, fired an even par 71 to come in at 3-under 139 in the 36-hole finale, edging out runner-up Mario Perez of Sequoia Woods CC by three shots. In Saturday’s first round at Quail Lodge Resort, Stricklin posted a 69. While Stricklin won the championship, 46-year-old E-Club Central Valley member Abraham Attouleh took home the big prize of WNT Player of the Year honors. He’d finish the season with 6,868 points thanks to a T-3 finish in the championship. He’d shoot 72-71 to finish at 143. Attouleh had some extra motivation. In 2017, he finished second in the Player of the Year standings. “I was very driven for redemption. It’s extremely gratifying,” he said.